Morbidity and mortality resulting from influenza have remained high in the United States despite efforts to vaccinate high-risk populations, leading public health officials to expand their vaccination recommendations to include schoolchildren (Fiore et al., 2009; Schmier et al., 2008). Vaccinating schoolchildren against influenza is important not only because they are at high risk for becoming ill from influenza, but also because they spread the virus to each other and to those at risk in the community, including older adults (Schmier et al., 2008). Annual vaccination has been recommended for all ages since 2010 (Fiore et al., 2010), and the Healthy People 2020 goal is the vaccination of 70 percent of children aged 6 months through 17 years (Healthy People 2020, 2015). However, in the 2010–2011 season, only 47 percent of children in this age group received vaccine against influenza. Historically most children have received the vaccine from their primary care provider, but this is often inconvenient since primary care providers’ offices are normally open when children are at school and their parents are at work. This inconvenience may play a large role in the failure of the current clinic-based approach. In 2008 the Community Pediatrics and Adolescent Medicine (CPAM) practice at Mayo Clinic in Rochester, Minnesota, was experiencing difficulty keeping up with appointment access for children whose parents were requesting the influenza vaccine for their children. The CPAM practice could accommodate about 5,000 patients, but the need was for over 7,000 patients. The appointment calendars and nursing efforts were over their maximum capacity. Around the same time, the Minnesota Department of Health was planning to offer free influenza vaccine if it could be delivered in the elementary school setting at no charge to the students. In addition to helping with capacity issues in the clinic, providing vaccinations in a school setting offers convenience for children and parents, resulting in reduced time away from school and work (Humiston et al., 2014; Kempe et al., 2014a). This alternative strategy had the potential, if it could overcome the billing and reimbursement issues faced by programs funded through third-party billing, to increase the number of children getting the vaccine, including giving vaccines to those children who had never received the influenza vaccine previously, and also to become self-sustaining (Kempe et al., 2014b). In 2009 Olmsted County Public Health Services (OCPHS) reached out to both Mayo Clinic and Olmsted Medical Center, the other major primary care practice in Rochester, to initiate a school located immunization program. OCPHS had previously been conducting its own school-based immunization clinics and had several processes in place. 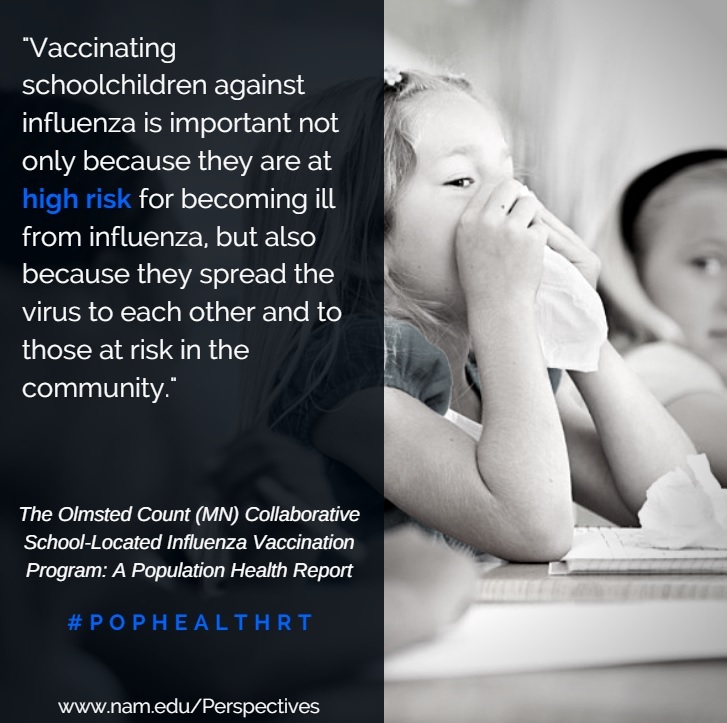 The three groups worked with Rochester’s public school district to conduct a pilot project in two elementary schools to assess the feasibility of health care entities and the school district cooperating to offer vaccination against influenza in the schools. The initial challenges included working together with competing practices, identifying a financial plan that worked for all organizations, identifying a registration process that worked for parents, vaccinating children without parents present, minimizing time away from the classroom, and developing a reproducible program that could be expanded to other schools. In the first year, parents who wanted their children to participate in the program completed paper registration forms. At each of the two schools, school officials selected a particular morning or afternoon in September for the event and decided on a non-classroom location in the school where the vaccinations would take place. The officials agreed to a system for identifying and chaperoning the children. School officials gave teachers the registration forms completed by parents, and the teachers identified students for vaccination. Both Mayo Clinic and Olmsted Medical Center appeared at the school on the selected date with a team of nurses, information technology experts, registration personnel, and the necessary equipment and supplies, including refrigerators, computers, and vaccine. The vaccines, which were provided by the state, were offered to all children free of charge. Most parents selected the live, attenuated influenza vaccine to be given by nasal mist, but the program made the inactivated influenza vaccine given by injection available as well, and approximately 10 percent chose the injectable form, given in private if necessary. Program staff confirmed that each child had the correct, identifying registration form, and each child was then immunized by a nurse from his or her own health care provider (either Mayo Clinic or Olmsted Medical Center). The health care institutions provided emergency medications to be available in the event of an adverse reaction, as well as protocols for their use. Nurses used laptop computers connected by wireless Internet to document the vaccine in each child’s electronic health record on-site. That evening the organizations transferred documentation of the vaccinations to the state immunization registry, the Minnesota Immunization Information Connection. At each school the teams were able to complete the process in less than 2 hours, limiting the students’ time away from the classroom to an average of 15 minutes and vaccinating a total of 170 students. The next year, in 2010, the program expanded to include four additional elementary schools, including one private school. The group was now a collaborative effort including Olmsted County Public Health Services, Mayo Clinic, Olmsted Medical Center, and several Olmsted County public and private schools. The group met on a regular basis during the year to plan the expansion and improve practices. In the second year clinical assistants were added to aid in documentation and increase the speed of the vaccine delivery. The vaccines were still offered free from the state, but now both health care organizations were able to bill a child’s insurance company for an administration fee through remote access into the electronic health record. In 2011, leaders of the Southeast Minnesota Beacon Program, funded by the U.S. Department of Health and Human Services, expressed an interest in collaborating with the school-located immunization program. With their participation and guidance, the program was able to establish an electronic registration process to supplement the paper registration forms, assist with data analysis for future planning, and increase the use of media outreach and communication for promoting the clinics. Officials from the national Beacon Communities in Washington, D.C. visited one of the elementary schools that year and received their influenza vaccines while interacting with program participants. Under the Beacon initiative, the program continued to expand over the subsequent years. Mayo Clinic and Olmsted Medical Center supplied their own influenza vaccines for the first time in 2011, billing individual insurance companies for both the vaccines and administration fees. Both entities utilized state-supplied vaccines from the Vaccines for Children Program to ensure that all children, regardless of socioeconomic status, would have the opportunity to be vaccinated (Santoli et al., 1999). The school-located immunization program has grown significantly since 2009, moving from 170 students at two schools to nearly 6,200 children in 36 schools, now including middle and high schools in the county (Table 1). The student participation rate has nearly doubled, from 20 percent in 2009 to 39 percent in 2014. In the first year of the initiative, 27 percent of the students vaccinated had never received the influenza vaccine. In the second year, this percentage increased to 34 percent with the four additional schools. This met a desired goal of reaching children who had never been vaccinated against influenza. The program continues to reach first-time vaccinees. For Mayo Clinic, the school-based program currently vaccinates 41 percent of their elementary-age patients who get the influenza vaccine. As a result, the school-based program has alleviated the clinic’s previous staffing and access restrictions. Financial analyses from Mayo Clinic indicate that the cost-effectiveness of vaccinating in school has been substantial. When all cost factors are considered, on average, it is $50 to $80 less per dose to vaccinate in the schools than in the clinic setting. Olmsted County has maintained a high rate of influenza vaccination for the elementary-age population, specifically among children ages 5 to 9 years old. This age group represented the majority of the population that was vaccinated through the program from 2009 through 2013. The influenza vaccination rate for children 5 to 9 years of age in Olmsted County has averaged 62.4 percent since 2010. This is well above 10 other Southeast Minnesota counties, which collectively average 35 percent vaccination rates, and is also above the current national rate average of approximately 55 percent. In 2015 the program was expanded to 47 out of the 50 schools in Olmsted County, including all public and private elementary and middle schools; the exceptions are three Rochester public high schools. With current participation trends, this increase brings with it the potential to vaccinate over 8,500 children. The goal for 2017 includes expanding to the last three Rochester public high schools. Motivated by the need to address a lack of clinical capacity as well as the potential to deliver free influenza vaccinations, competing health care organizations began to work with the local public health agency, which eventually led to an ongoing collaboration and then an established partnership with county schools. The county now has an annual program to bring influenza vaccinations to schoolchildren in every elementary and middle school and some high schools in the county. This is a self-sustaining program as it is fully funded through the children’s health insurance programs, including the Vaccines for Children program, and each health care institution. The program has overcome significant barriers and challenges over the years. At times the sheer scale of the project seemed overwhelming, causing those involved to consider backing out. Other challenges included problems with computer connectivity, staffing shortages, delayed vaccine delivery, cost and workload balance, and pushback from the schools regarding expansion of the program to students attending middle and high schools in addition to the participating elementary schools. The expansion to the middle and high schools presented new challenges related to finding a different process for chaperoning students to the vaccination area, as middle and high school students are no longer grouped together in common classrooms throughout the day. In 2014, the Rochester public school district voiced concerns that the program needs were growing too large for the school district to handle with current staffing and budget. In 2015, Mayo Clinic provided additional staff to cover the roles and responsibilities previously held by the licensed school nurses in the district. For future influenza seasons, Mayo Clinic is considering hiring additional staff to support not only the school immunization program in this capacity, but also to work with other population health management initiatives involving school-aged children in the school setting. The success of the program has solidified its future. Parents from across the county are enthusiastic about this program. In a number of instances, parents have organized themselves to request that their schools participate in the program. Over the years, parents have reported that they overcame fears and misconceptions about the program and have grown to appreciate the convenience and to support the program’s continued expansion. Initial goals have all been met. These include providing convenience for children and parents in reduced time away from school and work, increasing the proportion of children receiving first-time influenza vaccinations, addressing appointment access and capacity issues in the clinic, and increasing herd immunity. Preliminary data suggest that the schools that have participated in the program have had fewer outbreaks of influenza-like illnesses than schools that did not. With the continued success of the program, in 2014 the school-located immunization program (SLIP) established a formal partnership which included a formal agreement of activities as a memorandum of understanding (MOU) between the collaborating entities. This MOU includes a mission statement, a statement of purpose, a list of partner and participant responsibilities, and a list of operating procedures. The group maintains a shared responsibility of activities and cost. The SLIP steering committee meets year-round on a monthly basis to celebrate successes, identify problems, and plan for expansion of and improvements to the current program. The SLIP’s current goals include expanding school-based influenza immunization to the last three schools in Olmsted County and bridging into adjacent Dodge County, which is the site of an additional Mayo Clinic primary care practice. A near-term future goal is to provide additional vaccines in the school setting, particularly the human papillomavirus (HPV) vaccine. Given poor state and national HPV vaccination rates, the requirement of three doses to complete the series, low rates of adolescent participation in routine preventive care, and the status of HPV as a public health priority, this potential project would provide a convenient way for children and adolescents to get the vaccine series. It would also provide an excellent opportunity for education regarding the virus and the prevention of HPV infection and associated cancers. Fiore, A. E., D. K. Shay, K. Broder, J. K. Iskander, T. M. Uyeki, G. Mootrey, J. S. Bresee, and N. J. Cox. 2009. Prevention and control of seasonal influenza with vaccines: Recommendations of the Advisory Committee on Immunization Practices (ACIP), 2009. MMWR 58(Early Release):1–52. Fiore, A. E., T. M. Uyeki, K. Broder, L. Finelli, G. L. Euler, J. A. Singleton, J. K. Iskander, P. M. Wortley, D. K. Shay, J. S. Bresee, and N. J. Cox. 2010. Prevention and control of influenza with vaccines: recommendations of the Advisory Committee on Immunization Practices (ACIP), 2010. MMWR 59(RR-8):1–62. Healthy People 2020. Immunization and infectious diseases. http://www.healthypeople.gov/2020/topics-objectives/topic/immunization-and-infectiousdiseases/objectives (accessed June 23, 2015). Humiston, S. G., K. A. Poehling, and P. G. Szilagyi. 2014. School-located influenza vaccination: Can collaborative efforts go the distance? Academy Pediatrics 14(3):219–220. Kempe, A., M. F. Daley, J. Pyrzanowski, T. M. Vogt, E. J. Campagna, L. M. Dickinson, S. J. Hambidge, and J. C. Shlay. 2014a. School-located influenza vaccination with third-party billing: What do parents think? Academy Pediatrics 14(3):241–248. Kempe, A., M. F. Daley, J. Pyrzanowski, T. Vogt, Hai Fang, D. J. Rinehart, N. Morgan, M. Riis, S. Rodgers, E. McCormick, A. Hammer, E. J. Campagna, D. Kile, M. Dickinson, S. J. Hambidge, and J. C. Shlay. 2014b. School-located influenza vaccination with third-party billing: Outcomes, cost, and reimbursement. Academy Pediatrics 14(3):234–240. Santoli, J. M., L. E. Rodewald, E. F. Maes, M. P. Battaglia, and V. G. Coronado. 1999. Vaccines for Children program, United States, 1997. Pediatrics 104(2):e15. Schmier, J., S. Li, J. C. King, K. Nichol, P. J. Mahadevia. 2008. Benefits and costs of immunizing children against influenza at school: An economic analysis based on a large cluster controlled clinical trial. Health Affair 27(2):W96–W104. The authors would like to acknowledge several individuals who over the years made major contributions to the Olmsted County Collaborative School-Located Immunization Program and without whom the collaboration would have surely foundered. These individuals include Linda Haeussinger, R.N., former public health nurse manager for clinic services at Olmsted County Public Health Services, now retired; Marty Alemán, R.N., public health nurse manager for health promotion at Olmsted County Public Health Services; Mary Ann Kachelski, R.N., nurse manager at Olmsted Medical Center; and Eric W. Lindskog, information technology senior analyst programmer at Mayo Clinic. Development of this manuscript was funded, in part, by the Mayo Clinic Robert D. and Patricia E. Kern Center for the Science of Health Care Delivery. The authors are all on staff at Mayo Clinic. Jennifer L. Brickley, R.N., is the primary care immunization program coordinator. Tammy L. Schmit, R.N., is the primary care pediatric nurse supervisor. Lila J. Finney Rutten, Ph.D., is the scientific director of the population health science program in the Robert D. and Patricia E. Kern Center for the Science of Health Care Delivery. Jennifer L. St. Sauver, Ph.D. is the co-principal investigator of the Rochester Epidemiology Project. Karen L. Ytterberg, M.D., M.H.A., is the chair of the Mayo Clinic Operations Coordinating Group. Robert M. Jacobson, M.D. is the medical director of the population health science program in the Robert D. and Patricia E. Kern Center for the Science of Health Care Delivery.